Moctezuma II (1480-1520), also known as Motecuhzoma, was the ruler of the Aztec Empire when Hernando Cortes arrived in America. Cortes took Moctezuma captive and proceeded to conquer his empire. 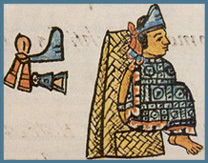 Moctezuma became leader of the Aztecs in 1502, succeeding his uncle, Ahuitzotl. This page was last modified on 7 October 2016, at 17:38.